Those of you who have only been playing games for the last few years may think North American box art has always been on par (or nearly on par) with the art that graces the covers of Japanese releases. Unfortunately, that's far from the case--a fact that's made painfully clear by looking at the box art that appeared on your average 8-bit, 16-bit and even 32-bit title. The worst offenders of the above-mentioned bunch: The great majority of the box art produced for Sega's Master System and NEC's TurboGrafx-16. That's not to say all of the art that appeared on the cases of those systems' games stunk. For instance, Laser Ghost's cover art (right) was pretty darn nice, all things considered. Strangely, as Back of the Cereal Box's Drew Mackie points out in a recent post, the game's name has little to do with its intriguing cover art--or its content. What name should the marketing folks at Sega's European arm have given the game instead? Mackie offers up a number of hilarious suggestions in the aforementioned blog post, with my personal favorite being Quinceañera of the Damned. 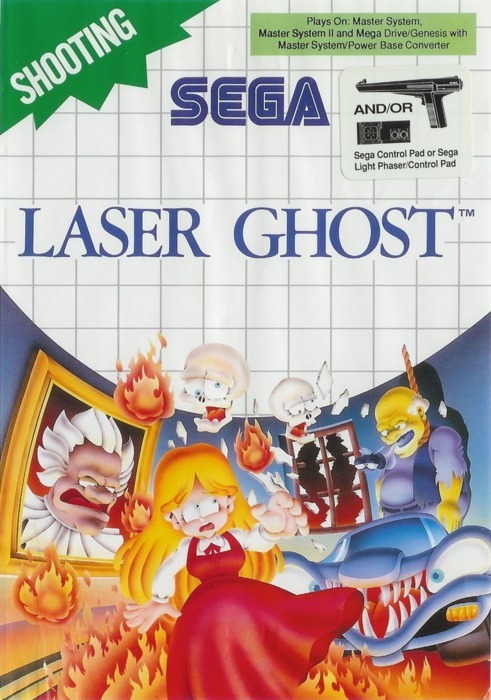 To see Mackie's other suggestions--as well as footage of both the arcade and Master System versions of Laser Ghost--check out "Laser Ghost! (May Not Contain Ghosts or Lasers)" at your earliest convenience. Still, "Slightly Atypical Sleepover" is another fine choice that resonates with me strongly for some reason. If there was some sort of pillowfight stage or makeover boss, I could see it working quite well. This game looks pretty intriguing, actually. I have no experience with lightgun-based games outside of a few on the NES, and at least this title seems to have a unique twist on the genre. As opposed to your typical Duck Hunt clones or Wild West gunslinging games, at least. As for 'Slightly Atypical Sleepover' -- I like it, too. Hell, I like all of Drew's suggestions! The video of this game that Drew posted on his blog looks a bit messy to me, honestly. The graphics are OK, although maybe a little too 'Addams Family on the TG-16' for me, but the gameplay looks kind of annoying. I'd maybe give the game a shot (har har) based on concept alone, but I wouldn't go much out of my way to do so. In fact, considering lightguns don't work with HDTVs, I'm not even sure how I'd play it! Ha! I love your pun :) As for not going out of your way to try the game, I'm in full agreement. Ha ha! I like that one, too :) Like I said earlier, Drew was spot-on with all of them. Maybe I should post video game stuff on my blog just to hear your compliments. Has anyone told you that you're an unfailingly nice guy? Kamiwoo: Yup. I forgot the tilde. How could I forget that? I love tildes. Justin: He really does look like a Simpsons character. Like ol' Gil finally gave up and hanged himself. And finally, for the record, my personal favorite was "What Happens to Little Girls Who Have Naughty Thoughts," but that's probably because I was raised Catholic. Drew: Actually, you *should* post about game stuff more often :) Every time you do, not only do I enjoy it, but I think to myself, "Damn, I wish I had thought of that!"